We all know we've been there...you purchase something with the hopes of it magically changing your life, even though realistically you know deep down that it won't, and then you have to face reality when it doesn't live up to your expectations. I feel like I'm the queen of that because I've got a lot of product regrets to share with you today. This is only the tip of the iceberg, if I included everything we'd be here all day. Some things I've already tossed out or given away so those couldn't be included but I did want to include as much as I could. Some of these photos I took months ago when I first got this idea, some I took just for this post and some images I salvaged from either previous Instagram or blog posts and I did that to cut down on time since this is already going up a day late (sorry bought it but at least it's a holiday weekend). I'm writing my intro here after having already typed out the bulk of this post and you're going to see me mention selling used makeup on Poshmark more than once - I only sell the items that still have a lot of product left and were either used in a sanitary way or can be easily sterilized. I just wanted to let you know that I do take sanitary and sterilization very seriously when passing on used makeup because I wouldn't want anyone to get any sort of reaction or infection because something wasn't treated properly. I also want to mention that not all of these products are on here because they're bad products, though some are, others I just haven't gotten my proper use out of and that's why I regret it but I do still like most of these brands very much. Now that that's all out of the way, let's get down to the nitty gritty! Oy vey. Where to even start with this one…well, first off there’s only 16 shades. I know this is a smaller company but still, 16 shades??? I bought the lightest shade hoping for the best and unfortunately it does not match me, it’s too dark and too peach. I bought a white foundation to mix in and even though I can lighten it I also just don’t like the formula. It’s too matte for me, I think it’s supposed to be a satin finish, but on my dry skin it just feels way too matte especially since I’m used to wearing very dewy foundations. I haven’t tried it in a long time, it’s been sitting in a bin of stuff to either toss or try to sell, so I think it’s time that I parted ways and see if someone on Poshmark wants to try it before I chuck it. Would not recommend if you have dry skin or are on the super light or deep end of the foundation spectrum since their shade range is rubbish but it might work for those with normal or combo skin (not sure about oily). I panic bought this one because I thought/still think it’s being discontinued. It had been in my Sephora wishlist for ages and then I noticed one day that it said my shade was not just sold out but no longer available. I freaked out and went searching for it online and found the shade I thought I would be, N1, on Estée Lauder’s website and purchased from them since I noticed the shade ranges were dwindling on all the online retailers. Suffice to say that I am not shade N1, this one it’s own is probably a good two shades too dark but the undertone works for me, and this is the foundation that made me buy a white foundation because I really wanted to try it. Mixed in with my white foundation (discontinued Armani Maestro Glow in 0) I do actually like the finish but it’s nothing special that stands out in my collection so I might try sanitizing and selling it because I just don’t reach for it enough and I want to actually finish the foundations that I do like so I can eventually try some different ones. Sorry that these two are grouped together but this is one of the images that I had to borrow from something else but at least they’re the same kind of product. I bought the Marc Jacobs concealer because it went on sale and I have a sick addiction with trying concealers and thought I’d give it a whirl. The formula is just too thick and creases like crazy on me no matter how or what I set it with. The coverage is good but if you have any under eye wrinkles or texture then this is a no-go. I bought the Urban Decay concealer because I’d heard how high coverage it is and I have very dark under eye circles and wanted to see if it would cover them up. While the coverage is definitely there the shade selection is just not that great for my skin tone, I like pink/cool undertone concealers and UD doesn’t really do cool undertones in very many of their products. I ended up getting Fair Neutral but to me it’s too light on its own and is very drying so I ended up never using. I have recently started using it a little again by mixing it with the Tarte Creaseless Under Eye Concealer, not at all creaseless btw, which I got a free sample of with a Sephora order and the lightest shade they were sampling, Light, is just a little too dark for me. I actually ended up really liking the mixture and the way it wore and looked on my skin some I glad I can get some more use out of this product that way. I’ve also been using it as an eyeshadow base when I want to knock out all my eyelid veins and since it is a dryer formula it works pretty well on my eyelids (I have insanely oily eyelids and need a dryer base). The UD isn’t as big of a regret as the Marc Jacobs since I’ve started getting some use out of it again lately but I ended up scooping out all the Marc Jacobs concealer and using the container to hold foundation from sample packets (I had several foundation samples from the same brand so I squeezed them all out into the pot). Tragic waste of product but it is what it is and lesson learned; try it before it’s too late to return. This one makes me sad because these were pretty damn expensive. I regret all my Melt eyeshadows because I just don’t use them. YouTube 100% made me buy these and they did not live up to the hype. It’s not my favorite eyeshadow formula, they’re almost too pigmented for me for how I like to apply and layer eyeshadows but it’s not a bad formula at all. I bought the pro palette to stick the shadows in thinking it would make me use them more since it’s more convenient than the stacks but instead it makes me angry because it’s so effing bulky. I’ve kept them this long because because I have the Tarte Chrome Paint in the red shade and I wanted to use it with the reds from Melt but I’m seriously thinking about trying to sell these and just purchase a different palette with some reds (maybe the Melt Twenty Seven palette so I’m at least keeping it in the family). I think I’m going to try and sell my Melt shadows because I just don’t ever use them and it feels like a waste since I know that they are good shadow but they’re just not calling to me. Besides, somebody else might really want to try them so if I can sell them at a good discount to make them more affordable for someone that can’t normally afford them then that would make me happy to know they’re going to a good home. URGGHHH! I bought this and the following palette when I was working at Ulta because they went on sale and I don’t actually have very many eyeshadow palettes that Ulta carries so it was awkward when I was working there and someone, guest or other employee, would ask what’s on my eyes and I would have to tell them it’s something that we didn’t carry. I wanted to have something that I could wear that Ulta carried and since these had been marked down from $46 to $29 I bought all three Tartelette palettes and gave the Toasted one to my BFF for her birthday (since then the regular full price of the palettes has gone down to $39). I ended up not wearing eyeshadow to work very often because I didn’t want to get up early to do my makeup for a job that I hated so I literally used this palette once and I only used a few shades. I do currently have this palette listed on my Poshmark account since it was so lightly used and is in exceptional condition but this was not a great buy for me. And this one is the same story as the previous one. If you have one of the Tartelette palettes I don’t think you need any of the others since they are so dang neutral. Just get the one that goes with your eye color or skin tone best and you’ll be fine. I like the Tarte eyeshadow formula and find it to be a very easy to work with and blendable formula (beginner friendly). I actually already sold this one on Poshmark and the Posher gave me a 5-star rating so I’m really glad that someone who bought a used product from me is happy with what they received! Beautiful palettes though from Tarte but I’m just not interested in that many neutral shades anymore. Technically I didn’t buy this, as in I didn’t pick it out myself, since I received it in my 2017 Beautylish Lucky Bag but I had to include it because this is a product that has had so little use and I definitely would not have chosen this particular one for myself out of all the Viseart eyeshadow palettes (I like the 7 Cool Mattes). I’m definitely hanging on to this one because I think it does have a place in my collection if I can get over my fear of how bold and dark it is. I also think the two orange shades really scare me away from it since I freaking hate orange eyeshadow but I do like pretty much all the other colors. I need to get over it and quit being so dramatic because it is a beautiful palette and maybe by calling myself out here I’ll get to using it more. Don’t ask me why I bought these because I still don’t know why. I went through a lash phase about two years ago but I quite wearing them because I realized they look kind of ridiculous on me. Falsies to some people just add that extra oomph and really complete a look, Tati Westbrook is definitely one of those people, but then there’s people like Violette (Estée Lauder Global Beauty Director) who thinks they can really make a look appear too overdone and now I tend to fall more into that camp. I just don’t think I have a very good eye shape for pulling off falsies and when I worked at Ulta I was talking about it with a few other employees and they actually agreed with me and said they like me with just my natural lashes (I felt very validated for giving up the false lash life). Falsies are not for everyone and I am one of those people but I think on those with a lot of lid space, like RawBeautyKristi, falsies can actually look pretty good. Again, I bought this when I worked at Ulta simply because I wanted to try it. I had tried a few samples of the Anastasia Beverly Hills Dipbrow Pomade and really liked it so I figured I’d like this too and once they extended their shade range to include a cool mid-brown I figured now was the time. Then I had my hair dyed white blonde. Do you see the problem? I’m all for a darker brow with blonde hair but this is too dark for how white my hair is plus I prefer a grey or taupe brow with my white hair so this is too brown for that. Also, I don’t like this formula compared to Dipbrow because it’s a lot drier which I find hard to work with. And then there’s the size…this is absolutely tiny and it’s really hard to get product out of. I just would not recommend the mini to anyone and if you do want to try it go for a full size because it’s almost impossible for me to get product out of this tiny container. Hard pass and will probably be binned. When I started working at Ulta I had to start wearing my makeup for much longer periods of time then I was used to which meant I found out some things about my face and makeup that I didn’t know before, namely that my under eye like to crease even though I’m not that wrinkly under their. I bought this since it’s a pretty raved about powder and is recommended for drier skin types so I thought I’d give it a try. It doesn’t work on me 1) because it makes my under eyes look way too dry and 2) because it darkens my concealer. I think it’s just because I am so fair but it really irks me when something says translucent but then definitely isn’t translucent. I realized all this way after I’d bought it and could no longer return it so it’s currently listed on my Poshmark since I can’t use it. Would not recommend for those with fair to light skin tones but apparently it is a really good loose setting powder. This powder is also way too darkening for my under eyes which is why it’s also listed on my Poshmark (I swear this isn’t an add or me trying to tell you to buy my used makeup, just want to let you know what happens to something once I’ve given up on it). I bought this because Shannnxo raves about it but I am too fair for this powder. I think it would brighten on those who are more on the light-medium cusp of skin tones but this shade is too dark for fair or porcelain skin tones which is where I fall. I think this is also being discontinued since it’s on sale on Kat’s website and on Sephora and the shades that Sephora has sold out of have been removed from their website. Hopefully she’s coming out with something similar but in a better shade range. I thought I liked this when I first got it but I don’t. I don’t like the texture and it’s a little too dark for me. I like icy white, icy champagne or icy pink highlight shades (I think we get the theme here) since I am so fair. The undertone in these is just too dark for me so I gave it to my BFF. Some beauty influencers really like these duos from Pixi so if you’re not too fair it might be worth checking out. I was so excited about this when I first got it but I even said then that it was borderline too dark for my skin tone and it actually ended up being too dark to be a highlight on me. I could of used it as a blush topper but I’m not into that kind of product or extra step so I ended up trying to depot it and shattered the product. I really should never have bought it because I had a feeling from looking at online photos that it would be too dark of a highlighter for me and it was. Pretty gutted about this one since I am such a die-hard Charlotte Tilbury fan and it was very expensive so that was a complete waste of money. Epic fail. 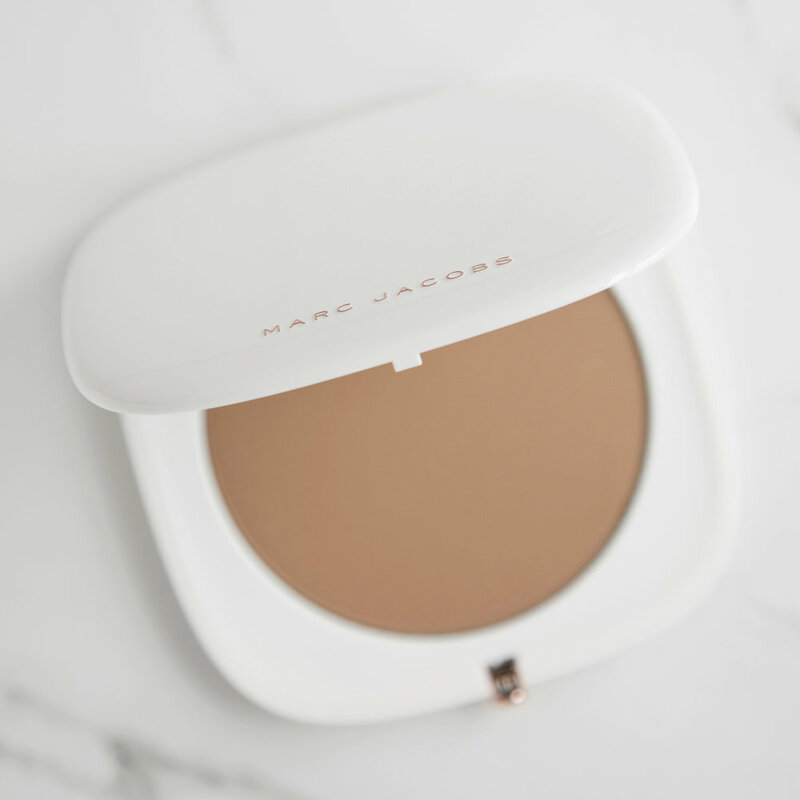 Marc Jacobs O!Mega Bronzer Coconut Perfect Tan in Tan-Tastic! This one is hard for me to admit since it’s another one that I haven’t had for very long but I’ve realized that once I find the one bronzer product I like I really tend to stick to it. I like the shades of some of my other bronzers better because they’re not as dark or as pigmented as this one so I find that I have to go in with a really light hand when using this one. The tone is not bad for me but I just have to be very careful when applying. I don’t like the way it works with my usual bronzer brushes so I picked up the white limited edition The Bronze brush from Marc Jacobs this weekend since they had it on sale for a pretty significant discount. Hopefully I can get an application that I’m more happy with once I have the brush that it was intended to be used with (no, this is not necessary at all but the brush is beautiful and I really wanted it and the sale price was really good so I caved but I could of totally made it work with my current brushes if I wanted to - I’m just extra AF). As I’ve mentioned before I have a deep love for Violette’s makeup style so when she came out with her own collaboration with Estée Lauder I picked up two pieces from the collections. I like the other item I got, a cream eyeshadow stick in a bronze-y shade, but I do not get a lot of use out of this one. It’s basically a face gloss. It’s meant to be used as a highlight or lip balm so there’s no color or shimmer to it. I like a more reflective, high-shine highlighter so on it’s own as a highlight this doesn’t do it for me. I don’t like it as a lip balm because I already have lip balms that I love a lot more. The only way I’ve found for me that I like to use this is in conjunction with another powder highlight and to layer it over top to take the powdery look down and add more of a glossy look to the skin. This is very much a no-makeup makeup type of item and I just don’t think I really needed it. I have gotten minimal use out of it but it wasn’t worth the money to me. I decided a while back that I was going to finally try the Armani Luminous Silk Foundation back when they had a 20% off site wide sale and I decided to pick up a few other things to try out and one was this balm. I totally got suckered in because I could have the lid engraved but I knew then that I didn’t need another lip balm yet I still splurged for it and now I’m stuck with this very pretty but very perfume-y smelling lip balm. I got a free lipstick with my order because I spent so much money, no shame, and I love that lipstick but I do not like this lip balm or the Ecstasy Lacquer because they’re both too heavily scented and smell a little grandma to me. So now I have this extra bougie lip balm and I don’t use it very often, in fact I actually forgot I had it until I was doing this post, but I might make it my purse lip balm since it is pretty and fancy looking. I’ll use it some but it was definitely unnecessary and a bit of a waste of money. Unpopular opinion but I don’t like the Bite Agave Lip Mask. I tried to convince myself that I liked it at first because everyone and their mother likes it but it’s just nowhere near as good as my Laneige Lip Sleeping Mask. This is so thick that for me it doesn’t actually do anything to heal my lips, it’s more of a protecter and sealant but not hydrator. I might clean this up with some rubbing alcohol and see if my BFF wants it (I give her used lip products all the time and she’s not weirded or grossed out by it since I sanitize everything first). It must work for some people because it’s so highly rated and talked about but it does not work for me and makes my lips peel. Again, bought this when I was working at Ulta. A guest was showing it to me and telling me how much her daughters like it and after smelling it I could see why. This really does smell amazing (if you’re into citrus that is) but it has the dreaded SLS in the ingredient list pretty high up and hence this dries the crap out of my skin. It’s so drying is basically strips my skin. I kept trying to make it work and got too far along to return it before realizing how much I hate it but I would not recommend The Body Shop shower gels or any other body washes that contain sodium laureth sulfate because they will dry your skin out. They must sell a lot of body butter because they dry out your skin so much with the shower gel first. Jokes aside, I bought this because of the scent as well but I don’t think it’s very hydrating for being a body butter. I also hate sticking my fingers into potted products like this, my nails are not short and I hate getting product underneath them. Products that come in jars or pots are just not very sanitary so I’m done with potted body moisturizers. I really like in-shower/wet skin lotions so that’s what I’ll be sticking to from now on. I bought this one on TJ Maxx’s website because I had never really dabbled that much into hair products and thought this might be a good one for my short hair. It worked okay, not quite as much hold as I think I was hoping for at the time, but the problem is that I had dark brown hair at the time and this product shows up in darker hair. I hadn’t noticed until I was editing a blog post that had a bunch of photos of my face in it and I saw a bunch of white stuff in my hair and realized it was this product. I have white hair now so I could use it if I wanted to but I’ve since discovered hair powders and much prefer the way those work on my short hair for how I like to style it so I’m probably going to end up throwing this out. Note: This post contains some affiliate links (on this post format you have to click an image to use the link). Affiliate links mean that if you use a link I've provided to purchase something I will receive a small commission but it does not effect your purchase price and helps to support my blog. I pay for everything my self, this is not a sponsored blog, so any little bit helps!